The next leg down is just around the corner. The markets have been warning of this for some time (as I’ve noted in recent weeks) but the move finally appears to have arrived. 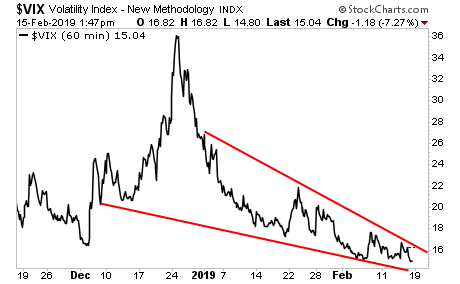 The VIX collapse that accompanied the rally in risk assets starting December 24, 2018, is about to end; the VIX is coiling tighter and tighter in a bullish falling wedge formation. The coming breakout will be truly spectacular. Moreover, this breakout is starting at a higher level than the one that was triggered by the 2018 collapse in the Short Volatility trade. From a technical analysis perspective, you would call this a higher low. 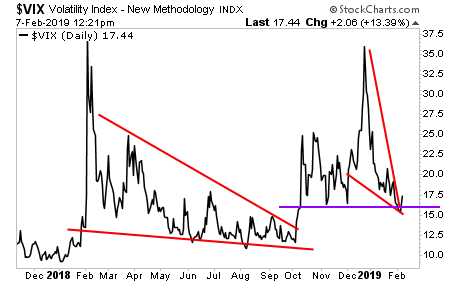 This suggests that the VIX will soon spike even higher than it did in 2018. 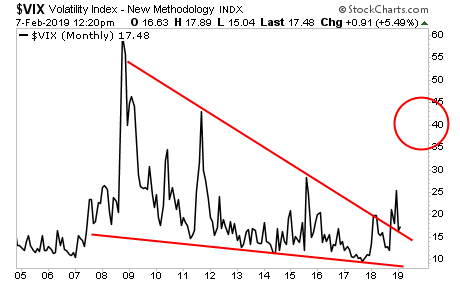 Indeed, the long-term monthly chart of the VIX suggests a move to AT LEAST 40. 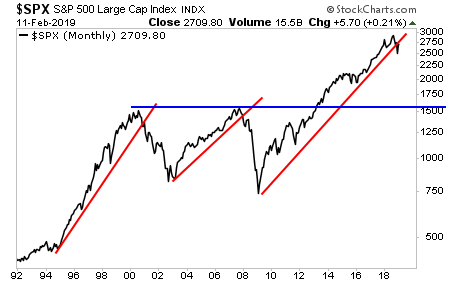 For stocks, this will mean a retest of the recent lows, possibly something worse. And deep down, the market knows it.